I’m happy to announce that OutsideIntel, my business intelligence platform, has been acquired by Bit Discovery (bitdiscovery.com). I will continue my work on the platform as the CTO of Bit Discovery; staying involved was always part of my plan for OutsideIntel even if it was acquired, so, for me this is perfect. OutsideIntel will be the back-end tech behind Bit Discovery, which is a much more sophisticated front-end on top of the high-performance data lake that I’ve been amassing for years. This acquisition was made possible through a venture financing round which allowed Bit Discovery to acquire my tech as well as the staff necessary to build out and improve upon the technology. It took about 20 years of wanting to build this idea. It wasn’t an idea I could easily explain though, nor could I afford it. So it sat in the back of my head eating at me for two decades. People thought I was nuts when I first explained what I wanted to do. Even my wife, who is normally extremely supportive said confidently and with amusement, “You can’t do that.” Sure, collecting years of meta data on the entire Internet in your basement sounds nuts…. Building a data lake by yourself is crazy. Doing corporate intelligence in your basement is crazy. I probably am crazy, but it worked. It wasn’t that the nay-sayers were wrong necessarily. Had they been talking to anyone else they would have been right, but in my case, they underestimated my willpower, my stubbornness and my vision. Lesson learned: Your dreams may not be as crazy as they sound. When I first started showing early prototypes of the tech I got a lot of comments like, “this UI needs a lot of work” and “no one should ever see this” and even “it is ugly.” Ouch. My expertise is not in UI, sadly. I had a number of long conversations with friends here in the US and overseas and one idea began to take hold after talking to my friends Simon and Pascal: I needed to completely stop talking about the UI. So, I shifted away from the front-end entirely and treated the front-end as merely a demonstration of what the back-end was capable of doing. By shifting that conversation away from the UI and to the APIs, it wildly changed how people perceived my work. Suddenly they could see dozens of use cases and it spawned partnerships and eventually helped OutsideIntel to get acquired. Lesson learned: Focus on what you’re good at and use that as your selling point rather than just the vision. Confidently flaunt the merits of your accomplishment. When I first started building the back-end for OutsideIntel (it was called Siftint back then, as in “sift through intelligence” – a short-lived name that still resides deep within the code and in my memory) I thought it would become a business intelligence platform for stock prediction. Gradually I realized there simply wasn’t a market for that, despite what everyone will tell you. It turns out people are afraid of this tech, and want more ordinary data sets that they can more readily comprehend. So, I had to make a very fundamental shift in how I talked about the data. Sure, it was good at finding correlation between market movements and IT infrastructure, but it was also good for security, and M&A, and sales enablement, and compliance, etc. Decisions, decisions. I had to find each and every use case and explore them individually. I eventually decided sales enablement was probably the best fit, and then, of course after making that decision Bit Discovery comes along and loves it for asset management. Cue me, flipping a table. So, you never know how other people are going to see your product/service. Lesson learned: You have to be flexible. Adapt to the market need. It took money – lots of money. You can’t properly estimate how much a startup will cost you until you do it. It’s always expensive. In my case, excluding opportunity costs, it cost me hundreds of thousands of dollars. Some of that was in legal expenses, some of it was in hardware, some of it was in hosting, some of it was in software, some of it was in data, some of it was random equipment to perform tests. It adds up. My wife said that if we didn’t have my company we could afford a ski condo somewhere, and she was right. There’s no way I could have done this without a big nest-egg or a family income to support me. Even still, I literally ran the company out of my basement for a year to save money. I had to have the power company come out and install 2×20 amp circuits to power my basement because it was becoming a fire hazard. As the infrastructure grew the noise got to be too much for me. I measured the decibels near the end and it was as loud as a gasoline engine running. All to save money. Lesson learned: Success often speaks to privilege. If you’re privileged enough you can try something that on the surface seems virtually impossible. But be frugal and careful with how you spend. 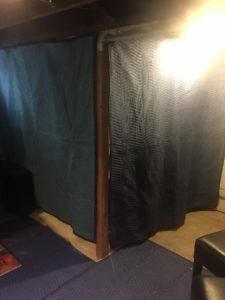 My janky “sound-proofing” system in my basement before the equipment went to the datacenter. This “feature” of my basement did cut down about 5db-10db of noise so it was worth doing. Not seen here is the baffling and ducting that was added later. It bugged me more than my wife, surprisingly. It was especially bad when the bulk processes would start and the small fans would kick on. Try relaxing when it sounds like someone’s got an engine running in your basement. 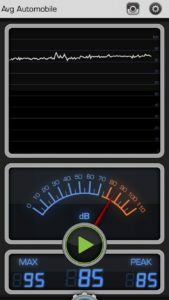 85 decibels in my basement at about 6 meters while no bulk processes were running . This is after my “sound-proofing” was built. It was closer to 90-95db at the rack while processing. Notice the needle is in the red: the “safe” amount of time to be in my basement was 8 hours, after which hearing damage may have occurred. I wore earplugs every time I went down there. One of the reasons this deal went through is because I know all of the players involved. I know the people who produce the data, I know the people collecting the data sets for sale, I know the customers, I know the devs working on the projects I needed, I knew the people who needed the data, and ultimately I knew the acquirers who happened to be long-time friends. I became friends with all of these people by being a trusted expert in the space, sure, but I kept them as friends because I never looked at them as a client or someone who could do me a favor. I treated everyone the same – as people with hopes and dreams and a desire to be happy in their home-lives and businesses alike. I try to help people when I can in whatever way I can. Sometimes that means I help them get jobs, sometimes I mentor them, sometimes I just let them talk about issues. Lesson learned: Never stop meeting people, and find ways to help them if you can. It ultimately works itself out. 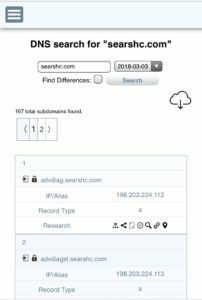 I built and re-built the software back-end of OutsideIntel four times. I spent hours talking to my wife who had to listen to my rants about the right and wrong way to build my infrastructure, or how pagination was broken even on sites like Google and Bing, and how was I supposed to get it right if they cannot? Or how modern hardware runs into IO blocking issues. Or how relational databases were too slow so I’d have to build my own data lake from scratch. Or how Perl wasn’t going to work at all and how I’d have to switch to Python after already having written tens of thousands of lines in Perl. Or the perils of Python’s strict typing and poor support on FreeBSD. It wasn’t just the software either. I had to re-build the hardware infrastructure three separate times to support the four different software builds. It took me years and countless bugs/revisions and hours of pacing around trying to design something that was fast, cheap, and would fit on the hardware I could afford before I settled on a design that appeared to finally work. I have no doubt it will take another re-build at some point. But that never stopped me. I wasn’t afraid of the hard work, and in fact, each new puzzle felt like a challenge, not a burden. Lesson learned: Don’t be afraid to fail fast. Just make sure you keep going. 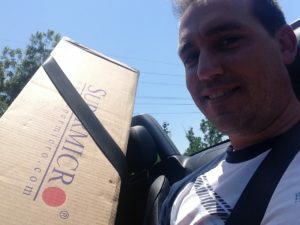 Here I am hauling the first server as part of version 2 back to the house. It turns out a 2U chassis does not fit in the trunk of a Z4 so it had to ride shotgun. Thankfully it was a convertible, or I wouldn’t have been able to get it in the car at all. I sold the Z4 shortly afterwards to cut insurance costs and also… what trunk? Setting things up for version 2. This ultimately became a costly failed version that lasted only a few months. My dining room was the de-facto staging area. My wife is very understanding. First computer being constructed as part of version 3. This was a complete re-think of the hardware. Once again, my wife let me “borrow” the dining room for a few days. 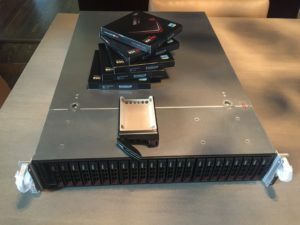 Each drive bay costs around a grand once populated with an SSD and there are two drive bays hidden on the back as well – you can do the math. After fully constructed, this single computer and the subsequent drives cost more than what I sold my Z4 for. Seems like a fair trade. A few years ago I really started eating my own dog food. Whenever I’d have a meeting with someone I’d use OutsideIntel to understand their company ahead of time, not just from a demo perspective, but to talk eloquently about what they were up to. I used it against corporations and even individual people with whom I was about to meet. That meant it had to be fast, and it had to be accessible from my phone, which lead me to do a backend redesign to support even faster lookups, pagination so that the browser wouldn’t crash and a frontend redesign to support mobile devices. That was messy, time consuming to do, and didn’t improve the look and feel very much, but it came in very handy, when, at a meeting I could look down at my phone and say, “Oh, I see you have an exposed QA server over here named XYZ.” People would say things in shock like, “Oh, I thought you were just texting someone. I didn’t realize you were hacking us.” I’d explain that it wasn’t hacking anyone and it led to a great conversation every time. That made a huge difference, to be able to show them the platform in real-time and use it as it was intended. It had to work on my cell phone too, because during travel I never carried a laptop (after all, I am the Smartphone exec). Lesson learned: Eat your own dog food and make sure it works anywhere and anytime you need to do a demo. Mobile design for one of the search types, with pagination, responsive design with sub-second lookup times. It may be a little ugly, but it works great. It took doing something no one had done before… sort of. At a very minimum the people who have tried this before were different people with different experiences and different ways of thinking about things. Not to diminish their work or their expertise, but my way of building OutsideIntel was different, interesting and it made the company valuable. That means that someone’s experiences and perspectives are worth something even in the case where others have “claimed” the domain of expertise. I didn’t let the presence of others dictate that I couldn’t touch their areas of interest – I just pushed through and built what I thought should be built in the way I thought it should work. Lesson learned: Any expert or leader in any category can be dethroned. You don’t have to be first mover necessarily, you just have to be the best and/or sufficiently different. A thousand things could have gone wrong. I had everything fighting against me on this project. It just seemed to be something that no one believed could be built until it was built and even when it was built they questioned how it could have possibly been built. Even when I was showing people demos they assumed it must be pre-canned because it couldn’t possibly be that fast if it weren’t. Virtually no one had faith in me. Subsequently, I was inundated with hair-brained sales ideas, or poorly thought out plans for monetization. Even my partners for the most part seemed to get excited for a few weeks or months ultimately only to lose interest and discontinue help. I couldn’t blame them, actually – nothing about OutsideIntel is easy. In the end I think this was largely luck. I was lucky to build something that was hard enough and useful enough that very few others would attempt it – especially on their own with zero outside funding. I was lucky that I found my acquirer when I did. I was lucky that despite the fact my wife didn’t believe it could be done, she supported me anyway, even as our bank account dwindled. I was lucky to have enough income to make it work. I was lucky to have the know-how and support of my friend James who helped me keep the hardware purring. I was lucky to catch issues and be able to afford them when multiple times bills unexpectedly spiked to 200% above the datacenter’s estimated costs. I was lucky to have an awesome partner/customer who became the acquirer. 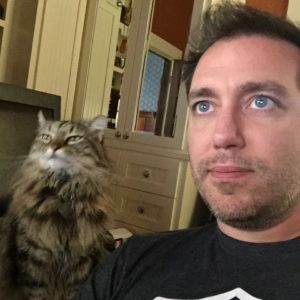 I was lucky that I stuck it out long enough when I had every reason to fold the company as the stress mounted – thankfully my cat does advocate for a low stress work environment, which helps. I was lucky – any one of those things could have been missing and it could have cost me a lot more… or even sunk the company entirely. Lesson learned: It’s not just expertise and willpower. It also takes luck. Without luck you have nothing. Rasmus and I doing pair programming. Seen here reviewing my code. By his expression, he’s unimpressed by my UI. Even though I mostly built the company from nothing, I did have help along the way, from friends and family who helped me write content, think through how to position myself and even try to help with sales. Even though much of that effort was ultimately unsuccessful, it meant a lot to my mental well-being as a founder of a company with an uncertain future. Don’t underestimate how lonely life can be when you’re the only cheerleader for your company. Lesson learned: Make sure you have a close network of friendly people to talk to. You’ll need a support system. 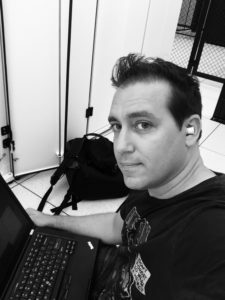 Sitting on the ground at the datacenter in the middle of the night debugging a process that is crashing access to the data lake. This night triggered a huge software re-build. It’s a lonely business when you’re the only one. You need non-cat friends. For the eagle eyed: this was one of the last days I used a laptop outside of the house – switching entirely to smartphones for work while away from the house shortly thereafter. Bit Discovery is the new home of OutsideIntel’s tech, and I’m proud to be working with one of my oldest friends, Jeremiah Grossman, who saw the vision and decided to make the leap. I can’t be more thankful for how things turned out and I’m ecstatic to be able to work on my favorite project for the foreseeable future. I’m happy to have found a team who understands how to turn my vision into something actionable and relateable – translating my brain and tech into enterprise discovery and asset management. Check out the website and if you want a demo of the Bit Discovery platform, please let me know!